How does air pollution impact upon insects? Air pollution is a global issue that regularly hits the front pages of our newspapers. Despite tough legislation, pollution levels in many areas remain above the legal limits. For example, multiple locations in London breached annual limits for the traffic-produced gas nitrogen dioxide within the first week of January 2016. Exceeding these limits not only poses major risks for human health, but also leads to substantial EU imposed fines for the UK. Rural areas are also regularly exposed to pollution transported from cities and major roadways and are increasingly impacted by ozone pollution due to both a rise in the global background and regular weather-induced episodic ozone peaks often referred to as ozone bubbles. One such episode was triggered during the August 2003 heat wave and is thought to have resulted in 2139 deaths in England and Wales. Concerns over public health have driven current efforts to reduce air pollution, but there is strong evidence to suggest that the health of plants and insects are also at risk. The honey bee for example, finds food by following the unique blend of volatile organic compounds (VOC) emitted by flowers. However, it was recently demonstrated in laboratory experiments that common air pollutants, such as diesel exhaust and ozone, can disrupt these floral odours, but we don't yet understand what consequences this might have in the real-world. 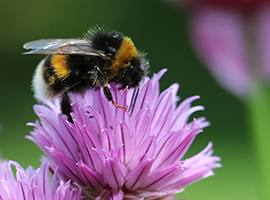 Nonetheless, it is clear that any disruption to these signals may have wide ranging and as yet unquantified impacts on the important ecosystem services they provide, such as pollination (estimated to be $361bn globally and £691m in the UK) and pest-regulation ($417bn globally). The DOMINO project, led by Dr Robbie Girling at the University of Reading, brings together a multidisciplinary team of Chemical Ecologists (Reading), Atmospheric Scientists (CEH) and Chemists (Reading) to investigate the mechanisms by which air pollution can disrupt vital airborne chemical signals that insects such as bees and moths use for critical processes, such as mating or finding a flower, and will evaluate the ecological consequences of this phenomenon. The DOMINO project is creating a step-change in our knowledge of this subject by radically advancing our conceptual understanding of how air pollution interacts with the VOCs that many insects rely on to communicate and interact with their environment. The DOMINO Team from left to right: Dr Paul Hayden, Dr Christian Pfrang, Dr Neil Mullinger, Dr Robbie Girling, Dr Dalila Toumali, Miss Zoe Ansell, Dr Eiko Nemitz and Dr Ben Langford. Dr Ben Langford at the Centre for Ecology & Hydrology is leading the projects investigation into how air pollutants might disrupt the chemical messages sent in floral odour plumes. His team have been working at the Environmental Flow Research Facility (EnFlo) wind tunnel at the University of Surrey to provide comprehensive evidence of how a range of key air pollutants (diesel exhaust (NO2) and ozone (O3)) in isolation and in combination, react and interact with a series of selected VOCs, which function as either floral attractants or pheromones. To do this the team are using a state-of-the-art proton transfer reaction time-of-flight mass spectrometer (PTR-Qi-TOF) to map out the evolution of the odour plume along the 15 m length of the wind tunnel. A synthetic blend of floral VOCs is generated using a diffusion system and fed into the wind tunnel airflow using the release manifold below. Cross-sections of the plume are made at regular intervals using the wind tunnels automated 3D sampling array. Measu ring the composition of the plume in near real-time (10 Hz) with the PTR-Qi-TOF has allowed the team to answer key questions like: how is the plume structure (size, number and frequency of odour filaments) altered; how long does the signal persist (what is the chemical lifetime of the odour); and how does the plume composition change (what products are formed and lost during interactions with pollutants). Answering each of these questions will allow the team to understand the potential impact of human generated pollutants on pollinators, like the honey bee, which we all depend upon for our food security. To understand the real world effects of air pollutants like ground level ozone and diesel exhaust CEH instrument technician Dr Neil Mullinger designed and constructed the world's first set of Free Air Diesel & Ozone Enrichment fumigation rings (FADOE). These 8 m diameter rings allow us to control the levels of ozone, diesel or both within each ring and present us with an opportunity to test how varying levels of these pollutants might effect the pollination success rates of the plants inside each ring. To put this simply, do bees visit the plants in the polluted rings less frequently than those with no pollution? The CEH team have set the rings up on the University of Readings Sonning Research Farm where they will be operated during the summers of 2018 and 2019 by Dr Girling and his PDRA Dr James Ryalls. CEH will monitor the concentrations of ozone and diesel exhaust in each ring from the CEH mobile laboratory. In total there are 8 fumigation rings, two controls (no pollutants), two releasing diesel exhaust, two releasing ozone and two releasing both diesel exhaust and ozone. The ozone is generated using commercial ozone generator whereas the diesel exhaust is produced from the heavy duty electrical generator which is used to power the experiment. Pollutant fumes are piped to each ring and released uniformly around the circumference. Pots of Black Mustard (Brassica Nigra) are placed in each ring for a period of 4-weeks during flowering, after which the pollination success rate is determined by determining the number of viable seeds from each plant. The Free Air Diesel & Ozone Enrichment (FADOE) rings designed and built by CEH Edinburgh.